There is nothing not to love in these biscuits. Its made of whole wheat and cheese. I love cheese, provided its rennet-free. And when you bake with cheese, something marvelous happens to it and it does wonders to your taste buds. These biscuits are quite phenomenal and I couldnt resist biting into them one after the other when they were out of my oven. I love to fill my cookie jar with homemade biscuits and cookies and more often than not they are sweet. If you like me are on the look out for savoury bites then look no further. You could call these wafers too, if you decide to cut them into very thin slices. I used my J. 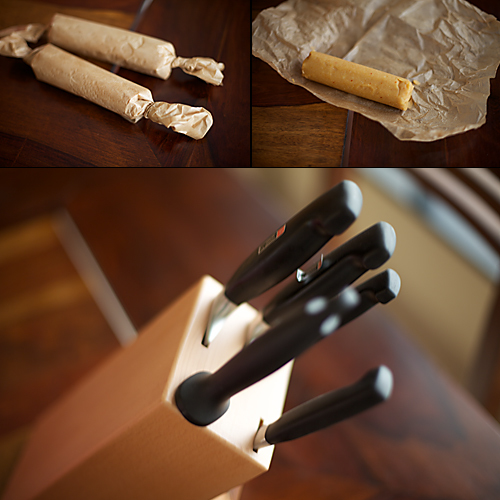 A Henckels chefs knife that Ro got me from Germany to slice them into wafer like biscuits. The dough looked quite exotic and when wrapped with brown baking parchment and sealed it looked all the more charming and I couldnt wait to bake them. Its been some time since we fell in love with cheddar cheese with smoked paprika and we can eat it as it is or over toasted or grilled bread slices. 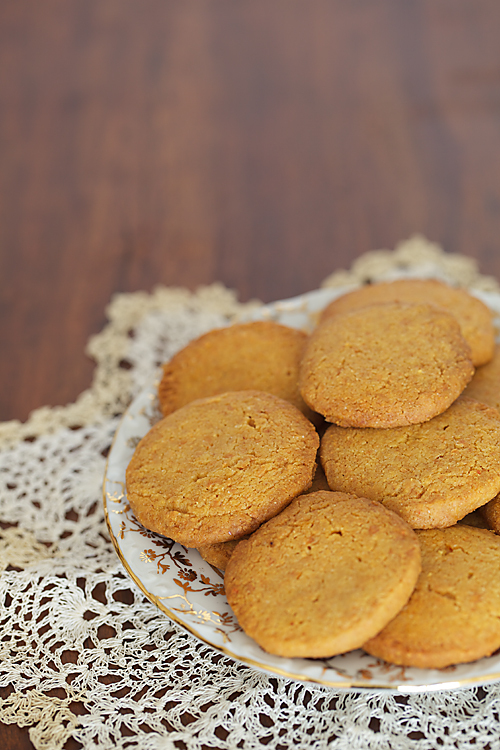 These biscuits made with cheese, butter, whole wheat and paprika are delicious beyond imagination. Depending on your oven and your preference the baking time for these could vary from 8 to 12 minutes. I like my wafers crispy and browned and bake it for longer, more like 10 minutes. In a large bowl, with the help of a hand held mixer blend the butter and cheese until smooth. In another bowl mix in the flour salt and chilli powder. Stir the dry ingredients into the butter and cheese and mix well with your hands until the dough comes together. Alternatively, cut chilled butter and cheddar cheese into cubes and process in a food processor fitted with a metal blade. put in the dry ingredients and process again until you you have a smooth dough. Do not over process the dough. Form the dough into a bal and knead briefly for a minute or two and then divide into 2 equal halves. Roll the dough into a log and wrap with baking parchment or greaseproof paper. Twist the ends to seal it (like a toffee wrapper). Chill the logs for 3 to 4 hours in the refrigerator. If you are in a hurry, put the logs in the freezer for abot 30 minutes. This makes it easier to cut into slices. Unwrap the chilled dough. Cut into 1/4” slices. Place them on a baking sheet covered with parchment or greaseproof paper. Bake in a preheated oven at 200 degrees centigrade (400 F) for 10 to 12 minutes or until browned at the edges. If you have cut your slices very thin, it could be done in 8 minutes. Very new to me.. Sounds interesting.. Awesome clicks dear.. Thanks for sharing this wonderful recipe.. Looks perfect !! lovely crunchy biscuits…does your son have them too?? Jyothi: I do know of the all purpose flour version, though I havent tried it. I'm sure it tastes great. Thank you for sharing your tips. Simi. :-))))))) You can pick and choose whatever you want from here. Your wish is my command! These look delicious, Anu. Why the hatred for rennet though?? Avanika: Not hatred, but aversion since I'm a staunch vegetarian and rennet comes from the lining of the stomach of a calf. Whew! I made these yesterday and they came out great. I used pepperjack cheese slices, so I skipped the chili powder and substituted it with a teaspoon of oregano. The taste was as you said, fabulous, but it took me close to 20 minutes at 400 deg F to get the slightly crisp texture! I wonder why – is it because my oven rack is positioned in the middle? Thanks heaps dear Anu for taking so much time & effort to share your lovely recipes with us.Among the Indian brands of cheeses which ones qualify as rennet free? Sowmya: Oregano here would be a nice twist. 20 min? Whew! That's a lot of time but I'm not sure if its because of the centre placement since these are baked with the shlelf placed in the centre of the oven. I hope you know that cookies and biscuits harden as they gradually cool. 15 minutes should be the maximum you must be baking these, in my opinion. Usha: You can safely consume any cheese manufactured in India. There is a regulation which bars the use of cow derivatives in the manufacture of cheese in India. Char:I got my parchment paper from the States. But if you are lucky you might get it in Hypercity (If they have not run out of stock that is). I use butterpaper quite liberally in the absence of parchment. I did realize they harden on cooling. But even then, they were just the right texture. Perhaps I cut them too thick. Thanks for the clarification on the positioning of the oven rack, Anu. Thanks for taking so much efforts in sharing your yummy recipes with the pics.Among the New Zealand brands of cheeses which ones qualify as rennet free? 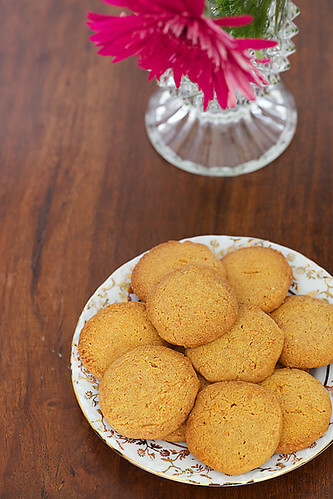 These do look lovely – have baked the savoury nankhatais before, but no other savoury cookies. Will give this a try soon. Should the cheese be grated before mixing with butter, or did you whiz them in a blender? Nandita: The cheese needs to be grated. Have made the edits in the recipe. Thanks for pointing this out. hey Anu, thanks 4 all the amazing recipes! they look great and must be tasting great too? I want to try them all but I have a microwave/convection so is it okay if i bake in it and what is the best ảrticles/bake tins(?) to bake in a microwave/convection as i just bought it and don't know hơư to make full use of it. please help. Hi everyone , is the red chilli optional ? or i'm obliged to put it ? Nidhi: You can skip the red chili if you wish, but it adds a lovely flavour and taste here. You can also use pepper. Wow! And I'm so glad it's whole wheat. Question: Can I substitute the butter with olive oil? And I was thinking of throwing in some dry herbs? Zatar or something sharp. What do you think? hi anushruti,can i use feta cheese? Lovely pics and a tempting recipe. I had one question…how long will they last in an air-tight jar. Can i keep them for 3-4 weeks? Aparna: Yes you could try doing that. The butter gives a good texture which oil won't so if you are willing to compromise on the texture go ahead! santhia: I'm afraid feta wont work here. Garima: They would keep a couple of weeks for sure. Chitra: Yes you can use Pizza cheese but cheddar would work best as pizza cheese would have mozzarella in it which will have a stringy texture. Can i use cream cheese instead of cheddar cheese? sanika: No, you cannot substitute cheddar with cream cheese here, since the texture of both the cheeses are vastly different. can we use salted butter and skip adding the salt? Azra- I have used salted butter in this recipe. I have noticed that this recipe does not call for baking powder. Do the biscuits turn out crisp and baked if not using this? Himu- Every recipe does not require baking powder. 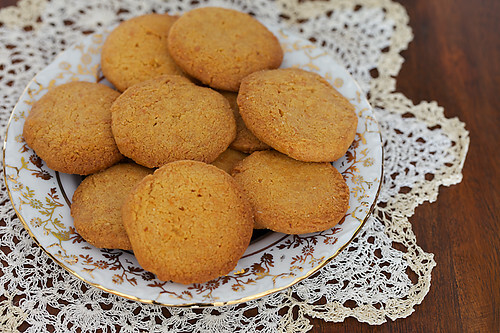 This recipe yields nicely baked biscuits, rich in flavour. You can bake for a couple of minutes more to make them crispy. Make sure they dont turn black.